Help us keep bringing you the Adirondack information you value. I know that most gardening columns are filled with advice on how to get rid of weeds. But I want to put in a good word for them. I’m looking at one really huge one right now just outside my kitchen window: the Box Elder tree (Acer negundo) that is wildlife Grand Central Station all year long, right here in the middle of Saratoga Springs. Of course, that could be because of the seed and suet feeders we hang from its boughs, and the discarded Christmas trees we cluster around the trunk in the winter, and the birdbaths we keep filled in every season –- including a heated one providing liquid water through 25-below-zero nights. But I’ve also read that — even without our additions — the Box Elder tree is ranked among those with the highest value to wildlife. That ranking is probably because of its seeds that, unlike those of other members of the maple genus, hang onto the boughs until well into the winter, providing food for squirrels and birds when most other seeds are gone. Another positive attribute is its ability to spring up from seedling to tree in a hurry, or as some might say, “grow like a weed.” That’s what our neighbor (who actually owns the ground this Box Elder grows from) said about this tree when he wanted to cut it down. “Just look at the mess it makes — bugs in the summer, seeds all over the place, leaves plugging up the gutters.” Well, we begged and pleaded and pointed out how its boughs provide privacy for his tenants, and he relented. Sort of. He cut down about half of it, but what do you know, it grew right back to its original height (and more!) in just about a year. Ha! Here’s the thing: if you love the birds and butterflies and want to have them around, you just have to learn to love bugs and weeds. Some people think I’m kind of a nut about that. Two years ago, I led a wildflower walk in downtown Saratoga’s Congress Park, a park more known for its Olmsted-designed formal gardens than for anything allowed to grow wild. But (oh happy fault!) there are geologic faults that run right through Congress Park, creating the springs that Saratoga is famous for, as well as steep banks and marshy spots where the mowers just can’t mow. And there’s where the wildflowers grow, dozens and dozens of beauties most often overlooked: Birds-eye Speedwell, Canada Anemone, Willow Herbs Northern and Hairy, Buttercups, Forget-me-nots, Cuckoo Flowers, Cattails . . . I could go on and on. Well, yes. It is. But such a nice one. I don’t think she thought I was nice when I responded to her revulsion: “Why would you want to get rid of it? Get rid of the grass instead.” Because, you see, that really is my ideal. Why would anyone prefer plain old grass to deliciously herby Ground Ivy (what a pungent, minty scent it emits when mowed)? Or to Speedwells of every kind, dainty little striped blooms in shades of blue from royal to mist? Or to Violets, white or purple or yellow? Or to Strawberries, Buttercups, Daisies, Clover. . . good lord, even Dandelions! All carpet the ground no taller than ankle-high, so they don’t need frequent mowing. All grow without needing to poison the soil with pesticides or chemical fertilizers. All thrive without being watered. All provide food for butterflies, caterpillars, ants, worms, birds, and bees. All are as pretty as pretty can be. And every single last one of them is a weed. Let’s hear it for weeds! Black Tupelo. That name evokes images of the Deep South, where Black Tupelo trees share gator-infested swamps with Bald Cypress and Loblolly Pine. So what the heck are they doing up here on the edge of the Adirondacks, sharing the Hudson River banks with White Birch and Swamp White Oak? That’s not the first question I asked myself upon finding this tree about 15 years ago. My first question was: “What the heck is this?” In all my years of wandering the woods and paddling the waterways of both Michigan and northern New York, I had never come across a tree quite like it. But here it was — glossy green in summer, radiant red by early fall – and whole bunches of them were growing in a marshy area of the Hudson near Glens Falls. Its Latin name (I later learned) is Nyssa sylvatica, which means “water nymph of the woods.” I can’t imagine a more appropriate name, for, in my desire to know this tree, it became like some kind of spirit beckoning me ever deeper into the woods. I trace my present fascination with all that grows to my first encounters with that beautiful tree. I became a bit obsessed by the subject, asking several so-called naturalists what they might know about Black Tupelo. Not much, it seemed, for time and time again I was told that it did not grow around here. The ones I had found, they said, must have escaped from cultivation. So imagine my excitement (maybe ten years ago) when I saw a notice that the Adirondack Mountain Club was hosting a lecture by a forestry Ph.D. student named Neil Pederson and the topic was Black Tupelos. Pederson did acknowledge that tupelos typically would not be found this far north or this far inland. But then he explained that the low-lying nature of the Hudson River/Champlain Valley allowed for the penetration of moist, warm air, creating a nearly uniform climate farther inland than would normally be expected. And he showed us numerous weather-pattern and plant-distribution maps to prove it. Hah! Told you so! At that same lecture I learned that Pederson had taken core samples of Black Tupelos growing in Lincoln Mountain State Forest in Greenfield, N.Y., just south of Corinth. That’s right next door, almost, to my home in Saratoga Springs. Here in a state-protected unspoiled swamp, about 30 specimens had grown to a very old age. How old? Well, Pederson’s samples indicated that at least one of these ancient trees was 554 years old. Five Hundred and Fifty-four years! According to his calculations, that tree first sprouted in 1448. That’s 44 years before Columbus set sail. I guess those trees had not escaped from cultivation. For years I tried to find a way to visit those trees. I obtained a topographical map of the area, but was warned that the swamp was almost impenetrable and of course there were no trails or markers and I was sure to get lost. Then just last winter I met a man who not only knew all about those trees, he also lived on the edge of the swamp where they grow, and knew how to get to them. Vince Walsh is a nature educator, a New York State licensed guide, and owner of Kawing Crow Awareness Center in Greenfield, his property abutting that Lincoln Mountain State Forest. Vince claims that these tupelo trees have been sampled again in the years since Pederson’s findings, and this time the samples indicate some trees are more than 800 years old. Just imagine! If what Vince told me is true, then these trees began their lives at the time the Crusades were going on across the Atlantic. But even at “only” 554 years, that tree would be the oldest one in all of New York State. Vince took me to see those trees this past March, while ice still covered the frozen muck and we could make our way without sinking up to our knees. It’s hard to describe what I felt gazing up the huge trunks to the gnarled twisted branches high overhead. I’ve actually seen taller and bigger trees (these tupelos are around 70 feet high, maybe 36 inches across at shoulder height), but these trees exuded a presence. We just sat in silence among them for a long, long while. What had they witnessed over the span of 800 years? And how had they escaped the logger’s ax? Vince told me these trees hollow out from the top as they age, making such ancient trees as these unsuitable for ships’ masts or building lumber. By the time Europeans would have discovered them, they already would have been at least 300 years old. Unfortunately, what age or loggers didn’t bring down, the beavers may. Back in that Greenfield swamp, we found one ancient tree that beavers had girdled – certain death in just a short time for that one. And along the Hudson River at Moreau, in one swampy spot where dozens grow, every single one has the bark gnawed off all the way around, to a height of about three feet. It’s really a mystery to me why the beavers do this. They haven’t toppled a single one to get at the treetop branches. Is the heartwood too hard for even a beaver’s teeth? Or are they deliberately killing these trees so that trees they prefer will take their place? I know that beavers are very smart and capable of strategizing. Are they actually capable of such deliberate dendrocide? So it could be the days are numbered for “my” Black Tupelos, the ones along the Hudson I visit in every season, as if in pilgrimage to my totem tree. A few here and there remain undamaged, so I’ve asked the naturalists at Moreau Lake State Park to devise some way to protect them. What a loss it would be to not find that vivid glossy green in summer, that radiant red in the fall! These trees start to redden many weeks earlier than others, starting as early as now. Often, only half of its leaves turn color at a time, so that red and green leaves may populate the same branches at the same time. Male and female flowers occur on separate trees, and only the female trees bear the blue-black fruits that are craved by many kinds of birds, especially woodpeckers and thrushes. The fruits should be ripe by late September, early October, when the trees are as fully ablaze as the one in the photo above. I urge you to find a way to see these trees. As we now know, they’ve thrived around here for a very, very long time. But maybe not forever. Severe thunder storms. Stuck in the house. So what else is new this summer in northern New York? Now, nature addicts like me don’t mind a little rain. That’s what Gore-tex is for. But crashing branches and slashing lightning? No way am I hiking or paddling in that, and it’s driving me nuts. Where comes this craving to be out in the woods in all weathers (except severe thunder storms or maybe freezing rain)? It started when I was just a small kid, maybe 9 or 10, growing up in a boatyard on a lake in Michigan, with a dad who had lots of chores for me and who wasn’t all that nice about getting me to do them. But he had taught me how to paddle. And a winding creek ran between our lake and another, the banks lined with marsh and forest. And canoes were there for the taking. I soon learned that two turns of the creek carried me beyond the sound of my dad shouting about unfinished work. So the woods and the waterways became my refuge, my place to get lost on purpose. And so they still are. For 15 years I worked as a nursing assistant for Hospice, traveling all over Saratoga County to care for people in their own homes, people dying of every illness the human flesh can fail by. And I couldn’t fix it. Each day I had to walk into the heart of suffering. And stay there. Friends asked me, “How can you stand it?” One way was to go to the river, push off in my little canoe (a 10′ Hornbeck Black Jack, weighing 12 pounds), and as soon as I felt that smooth silken water bearing me up and smelled the sweet scent of mossy banks, I sensed that all was well. I could really believe that some great goodness lay at the core of creation, that death and change were just part of the scheme of things, and that all would be well, indeed. It’s funny. I thought I’d enjoy such nature magazines as Outside and Backpacker, but when I leafed through a few issues, I found the articles were mostly about surviving nature — enduring thousands of mosquito bites, falling off cliffs, freezing in the mountains, struggling across deserts, that sort of thing: Nature as something that had to be challenged or overcome. Not for me. I preferred to go to nature for its power to heal. During my work for Hospice, I witnessed this power in the lives of others, as well. Let me tell you about two of these folks. While it’s true they both eventually died, I know that their final days were enriched by getting them off the couch and out the door. Indeed I could. We drove to a site where he knew some Late Fall Oyster mushrooms might be found. While he sat in the car, he sent me off into the woods. It must have been angels (plus Dan’s good directions) that led me right to them. A whole bunch. I gathered a gallon or so, and you know, it might have been gold I laid in his lap, he was so delighted. And after that adventure, off we would go nearly every day until the day he died. He’d sit in the car with his oxygen tank (he had terminal heart failure), and we’d drive along the Hudson and Hoosick Rivers, visiting all the haunts of his youth. We found where he used to hide his canoe. We found where wild asparagus grew. He recalled how his father was gassed in the war. He remembered his mother’s struggles to run their tavern. He confessed how he started drinking young and how mean he had been to his wife when he was drunk. And he found at last the courage to ask for his wife’s forgiveness before he died. And he died in her loving arms. Then there was Eleanor. I’m not sure what Eleanor’s illness was. Terminal crankiness, probably. She lived in an assisted living facility, very nice, lots of social events, classes, good meals. She never left her room. She wanted her meals sent up. She wanted her shades pulled down. The one pleasure she allowed herself was to sit on the porch in her wheelchair on pleasant days. One day I rolled her down the ramp: “Some Blue-eyed Grass is blooming near the parking lot,” I told her. She reluctantly consented. She had never seen (nor ever cared to see) Blue-eyed Grass, but that day her eyes were opened. A sea of radiant blue covered a vacant lot, studded with bright yellow Small Sundrops and snowy Wild Strawberry. “Oh my! How pretty,” she said (in spite of herself). All summer we walked and rolled, on into the fall. If the day was rainy, she waited for me in her raincoat. She couldn’t get over the beauty of Blue Vervain (“How can that be a weed?”) or the tiny pink blossoms of Northern Willow Herb (“Wouldn’t they make a darling dollhouse bouquet?”) We picked gorgeous bundles of Panicled Dogwood (burgundy leaves, waxy white berries on hot pink pedicels) mixed with the dark maroon seed sprays of Curly Dock. Then we got in trouble for bringing in armloads of Goldenrod. Her daughter threw it all out: “Get those weeds out of here! They’re dropping pollen all over!” I heard that cranky tone and marveled: that’s how Eleanor used to sound. She didn’t anymore. When the editors of Adirondack Almanack asked me to take over Ellen Rathbone’s garden columns while Ellen is on vacation, I couldn’t help thinking, they have got to be kidding! Me, write a garden column? I guess they don’t know that I’m more of an anti-gardener. Not anti in the sense of “against” (I love other people’s gardens), but in the sense of “antithesis of.” In short, I’m a weed-loving wildflower nerd who will risk drowning and broken bones and heart attacks and Lyme disease pursuing additions to my wildflower “life list,” but I faint at the thought of cultivating the plot behind my house. » Continue Reading. A friend of mine in college had a pet skunk named Cauliflower. We heard tales of this unusual household companion, but sadly only got to meet her on the occasion of my friend’s funeral. The year before, while I was interning at a nature center near Syracuse, someone brought in an “abandoned” baby skunk. One of the staff worked with a rehabber and took temporary custody of the little animal until the end of the day. After giving it a meal of Similac, I volunteered to babysit. You haven’t lived until you’ve had a baby skunk nestled in your bosom for the better part of a day (I had to keep it somewhere warm and secure). Needless to say, I developed a fondness for skunks. In the ensuing years I have discovered that the mere mention of the word skunk causes cries of “pee-eeww” to leap from the mouths of every child, and even some adults, in the vicinity. Noses are pinched tightly shut, even though no actual skunk is nearby. This reaction amuses and baffles me. I guess some lessons are learned early and persist for a lifetime, whether legitimate or not. Striped skunks (there are, by the way, nine other species of skunks) are known to scientists as Mephitis mephitis. Once grouped together with weasels in the family Mustelidae, skunks now have their own family, Mephitidae, which is shared only with stink badgers, an animal found in the Philippines and Indonesia. It is easy to see why skunks were combined with weasels, for like skunks, weasels have many scent glands and can be quite aromatic. However, only skunks use their scent as a mode of defense. If one encounters a skunk, and does not threaten it in anyway, the skunk is liable to trundle along its merry way without a second glance. If harassed, it will give plenty of warning to leave it alone. First, it will stomp its front feet. If this doesn’t work, it will make little charges towards it’s harasser with its tail raised over its head. Should the intruder continue to bother it, the skunk will bend its nether regions around to the front, so both its nose and rump are facing the same direction, and let loose a stream of yellowish liquid, a potent musk that can be fired up to twenty feet away. The skunk can manage six to eight squirts before its supply is gone, after which it will require about a week to recharge. The active compound in the spray is butylmercaptan, Mother Nature’s answer to tear gas. While it will burn and sting the eyes, it will not persist (and the recipient will not go blind). Unlike man-made tear gas, the odor can persist for weeks and can be smelled up to a mile away. In short, it’s best not to bother a skunk. And why would you want to? After all, skunks provide a valuable service to those who grow crops, and they do it at night when we are asleep. They eat many grubs and grasshoppers and insects of all stripes that are considered pests to the farmer. True, skunks have been known to chicken eggs and sometimes even a hen, but these instances are considered rare. Skunks are true omnivores, consuming berries and bugs, mice and roadkill all with equal relish. That said, invertebrates make up the greatest portion of the skunk’s diet. During the 1800s and early 1900s, skunks were routinely trapped and bred in captivity for the fur industry. Believe it or not, their pelts were the second most popular fur in the business. But after about 1915 the demand for skunk fur started to decline, and all the skunk breeders had to find a new outlet. Skunks as pets became the next rage. Today pet skunks are hard to come by, mostly because they are illegal in most states due to the fact that skunks are the number two carrier (in the wild) of rabies. Red foxes, incidentally, are listed as number one. I have been asked several times by local folks why Newcomb has no skunks. My pat answer has been that it’s simply too cold here for them. However, I have learned from long-time residents that Newcomb used to have a good number of these black and white animals. Pursuing this, we discovered that skunks seemed to disappear about the same time that coyotes moved in. Hm…interesting. Part of me wonders, though, if it has more to do with the lack of open space than it does with the presence of coyotes. Skunks are traditionally animals of open spaces, preferring to live near agricultural lands and open woods. Sometimes they inhabit dense woodlands, and have even been found at elevations over 2000 feet, but this is not where they thrive best. Since Newcomb has reverted back to forest over most of its acreage (believe it or not, at one time most of this area was cleared for farms), I suspect this is what has driven the skunks from our fair village. We could learn a lot from skunks, who are truly pacifists at heart. They waddle their way through life, minding their own business, consuming pestiferous insects to help out (unintentionally) their human neighbors. We could all use a few more neighbors like this. 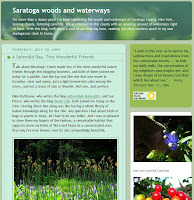 Elen Rathbone will be away on vacation for a couple of weeks so we’ve asked Jackie Donnelly, who writes the Saratoga Woods and Waterways blog, to fill in. She’ll be posting Ellen’s columns under the name Woodswalker beginning Sunday. Jackie is a former editor/writer recently retired after 15 years as a Hospice nursing assistant. She’s not a professional naturalist (she majored in English), but a self-described “lifelong nature enthusiast and wildflower nerd.” She also says she is an admirer of Ellen Rathbone, whose blog inspired her to start her own on January 1 of this year, she says “hoping to document a full year’s cycle of the beautiful wilderness settings and amazing diversity of flora and fauna close to my home in Saratoga Springs.” Liberated from land by her Hornbeck canoe, she primarily haunts the Hudson River where it forms the northern boundary of Saratoga County, with occasional forays into the “genuine” Adirondacks. Please join us in welcoming her. This last winter one of our local residents came in with a photograph of the strangest looking tracks in the snow. There were no distinct foot prints, and no well-defined gait pattern. What it looked like was a beautiful serpentine zig-zagging design; it reminded me of rickrack. And it looked familiar. I grabbed one of my tracking books and quickly thumbed through. Sure enough, there it was: porcupine tracks. » Continue Reading. The Adirondack Chapter of the Nature Conservancy gets a lot of attention when it completes a landscape-scale protection deal like the 161,000-acre Finch Pruyn purchase, or when it buys a place with a hallowed name like Follensby Pond. But for decades it has also been working among the little farms and forests of the Champlain Valley with a larger picture in mind. “The goal is to provide safe passage for species—a way for a moose, say, to go from the Adirondacks to Vermont with little risk of being struck by a car, or a salmon to make it far enough upstream to spawn without being blocked by a dry culvert,” Michael Carr, executive director of the Adirondack Chapter of the Nature Conservancy, said in a press release Monday. “Where are the most important habitat linkages and how do we work do we protect them? To date, we’ve raised several hundred thousand dollars in grants for this initiative in the Champlain Valley, which is a critical piece of a larger effort.” » Continue Reading. One of my favorite plants is one that is often overlooked by people, possibly because it frequents roadsides and waste areas and is therefore considered a weed. But this “weed” is responsible for the survival of one of our most beloved insects, helped save the lives of many World War II sailors and airmen, and has a sneaky reproductive life. 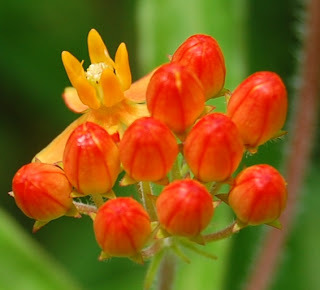 I give you The Milkweed. Milkweeds are members of the dogbane family and come in 140 varieties, of which I am familiar with about four: the dusty pink common milkweed (Asclepias syriaca), the muted magenta swamp milkweed (Asclepias incarnata), the brilliantly orange butterflyweed (Asclepias tuberosa), and the creamy yellow whorled milkweed (Asclepias verticillata). I suspect the latter is only in gardens, however. » Continue Reading. Believe it or not, there is a lot of competition out there for dead things. You’ve got your vertebrate scavengers, like raccoons and coyotes, vultures and ravens, which sniff out and eat tasty morsels that haven’t been dead too long. Then you have your invertebrates that are looking for a good body to eat or to use for a nursery for the kids: assorted flies, ants and beetles. Underground there are soil-dwelling fungi and bacteria that would also like their share. No carcass goes unwanted, and thank goodness. Last summer I came across a hairy-tailed mole right outside the Visitor Center. It was obviously dead, but as I watched, it seemed to reanimate! The body was moving! 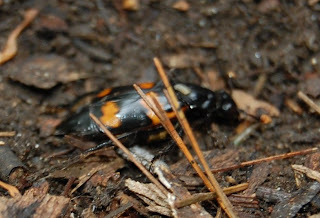 My curiosity piqued, I examined the body more closely and found not one, but two beautiful black and orange beetles working furiously at the body. They turned out to be a male and a female burying beetle (Nicrophorus carolinus), one of 46 species of carrion beetles found in North America. In the amount of time it took me to go inside for the camera, they had the body partially buried. Within half an hour it was gone. Carrion beetles come in to general varieties: Silphinae and Nicrophorinae. The major differences between these subfamilies are behavior and morphology. The Nicrophorinae are the more interesting of the two (in my opinion) because they actively bury the carcasses they find. First, the beetles must find the deceased, which they can do from up to a mile and a half away, detecting the fine chemical scent of decay (often within an hour of death) with their antennae, which can have some pretty nifty structures. Some have knobs, others fans or combs. These antennae are highly specialized to pick up long-distance scents. Once the body is found, the male and female beetles work together to bury it. Some may carry the body a short distance for burial, while others get right to work excavating beneath the corpse, which to the observer looks like it is slowly sinking into a miniature bed of quicksand. And just to show you how clever Mother Nature is, take note that the bodies of these beetles are flat, the perfect adaptation for scooting easily underneath a carcass, thus facilitating burial. Why do these beetles bury the carcass, where as those in the subfamily Silphinae don’t? It comes down to a matter of taste. Nicrophorinae don’t like maggots. Flies are equally adept at homing in on death and for the same reason: they want to lay their eggs on the body, providing a nutritious food source for hatching larvae. Nicrophorinae will eat fly maggots, but they don’t like it when there are too many of them. In fact, they have been known to abandon a carcass if the maggot infestation gets too high. Silphinae, on the other hand, love to eat the maggots, so they are less picky and don’t bury the body. The more the merrier. Once the body is safely secure underground, the female burying beetle lays her eggs on it and within a couple days the eggs hatch. Here is where another defining difference between the subfamilies comes into play: the adults will feed and defend their larvae. And before you know it, the larvae grow up, pupate and become adults, ready to find carcasses of their own. So let’s all give three cheers for carrion beetles…and all the other creatures that work to keep our woods, waters, roads, deserts, etc. clean and healthy. If they weren’t out there consuming the bodies of the deceased, diseases would surely run rampant, or, at the very least, the world would be a smellier place. I, for one, am happy to share the planet with them. There are few things as equally hair-raising and awe-inspiring as a chorus of coyote calls. My first experiences with these were of the hair-raising variety when I worked at a summer camp in Lake Placid for three years right out of high school. We spent the summer living in canvas tents that were draped over wooden platforms. At night we could see the fire reflected in the eyes of the “coydogs” that lurked in the trees between the junior and senior camps. And then we would hear the howls…no, the wails…no, the…the… Words fail to describe the sound these animals make when they all sing together, but it was enough to make me wish that we had a lot more between us than a flimsy canvas wall. These days I find myself enthralled by the coyote chorus that drifts through my bedroom windows at night. I poke the dog awake and we lie there listening to the music. However, there are admittedly still times when I am out walking the dog and we hear them, and they give me pause. Like the evening a couple years ago when we were coming home along the golf course and ran into a Wall of Sound. It was as though hundreds of coyotes had made a road block just around the bend in the road. I was fully convinced that we were about to see dozens of wild canines at any moment. I should’ve taken better note of the dog’s reaction, which was nil. Sound travels well in the cooler, damper air of evening; those animals, which sounded so close, were obviously further away than my imagination placed them. The history of the eastern coyote seems to be shrouded in mystery. Where did it come from and how did it get here? A hundred years ago, there were no coyotes in the Adirondacks (or New York State). A hundred and fifty years ago we still had wolves. Foxes were our only other wild canid. So how did we end up with this large animal that has so nicely filled the gap left behind by wolves? The basic theory is that the western coyote moved eastward. First it came to the plains and made a pretty good life for itself there. The plains coyotes, sometimes called brush wolves, were sometimes taken in by native people to work as beasts of burden. Because coyotes never really specialized, like wolves or foxes, they remained quite flexible in their behaviors, a trait that makes them highly adaptable to a wide range of habitats. It also makes them prolific breeders. As their population expanded, so did their range. The evidence suggests that when the coyotes crossed the Mississippi River, some went northward into Canada, circumventing the Great Lakes, while others went east and south. The frontrunners found themselves in new territory that had no other coyotes around with which to mate. Most animals mate exclusively with their own kind, but canines seem to be the exception to this rule, and those early coyotes found nothing to mate with but wolves. The influx of wolf genes helped create animals that were larger than the originals and that started to show some of the social structure found in wolf packs. So what about coydogs? To this day, children and adults alike talk about the coydogs they’ve seen. If you try to tell them that coydogs don’t exist, you’d best be prepared for a heated discussion, for they will not give up that notion. “My dad said that’s what it is” is a very difficult argument to refute. The first reported coyote-dog hybrid was in 1885, but whether this was scientific fact or anecdotal is conjecture. The first successful captive breeding of a coyote and dog was in 1937 and all the pups died. Captive breeding programs over the years demonstrated that coyote-dog hybrids end up with skewed breeding cycles, which result in pups being born early in the year when it is still quite cold and food supplies are low; most do not survive. Today eastern coyotes can certainly find plenty of other coyotes with which to mate, so there is no reason for them to set up housekeeping with feral dogs. Therefore, the likelihood of finding genuine coydogs in the 21st century is slim. It wasn’t until 1944 that the first coyote was recorded in Quebec, but it seems that after that it didn’t take long for them to appear along both sides of the St. Lawrence River. Accounts of “wild hybrid canids” being trapped and shot in the Adirondacks were showing up in 1942 and 1943. The 1950s found these mountains to be fairly well populated with the new eastern coyote. 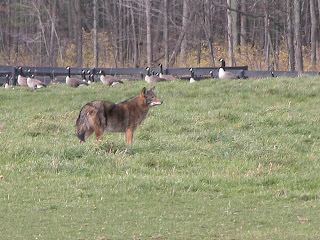 Today eastern coyotes are quite common throughout the Adirondacks. They have fairly good-sized home ranges (about 10 square miles), travel 10 to 15 miles a day, live in family units averaging three to five individuals, and eat a variety of foods. Many people suspect that coyotes are responsible for deer kills, and as a large predator they can and will take deer, but most of the coyote’s diet is made up of medium-sized prey, such as snowshoe hares and voles. I have been fortunate to actually see coyotes on a couple of occasions. The first was a large specimen who was crossing my yard in the early morning twilight about eight years ago; it looked so much like a German shepherd that I had to do a double take. A couple winters ago a smaller coyote crossed the road in front of us as the dog and I were headed home from our evening walk. In both cases the animal glanced at me, took note of my presence, and then slipped into the forest and vanished. And that’s as it should be – a brush with wildness that leaves you with a memory and a yearning for more. Photo courtesy of Daniel Bogan, PhD candidate at Cornell University, and Dr. Paul Curtis, DNR. Today marks the anniversary of one of the worst storms in Upstate New York history. During the early morning hours of July 15, 1995 a series of severe thunderstorms crossed the Adirondacks and much of eastern New York. Meteorologists call the phenomena by the Spanish “Derecho” but locals often refer to the event as the Blowdown of 1995. A similar weather event / blowdown occurred in 1950. A Derecho is part of a larger family of storms called a Mesoscale Convective System (MCS), a complex of thunderstorms that becomes organized on a scale larger than the individual thunderstorms and which includes phenomenon like lake effect snow. An MCS can sometimes act in ways similar to a hurricane and can produce torrential downpours and high winds. Aside from the remarkable power of the weather event, another unique thing happened – a shift in public policy with regard to salvage logging of public lands. The State’s decision to forgo salvage logging was in stark contrast to federal policies at the time that allowed federal lands to be logged in similar salvage situations. » Continue Reading. Now is the time for the ultimate light show. I’m not talking about the fireworks that lit up the sky over the 4th, nor those gossamer curtains that dance across the heavens when sunspot activity is just right (although, I must say that northern lights are a real contender). No, I’m referring to fireflies, those dancing lights that must’ve been the inspiration for many a faerie legend. So, you find yourself standing in your back yard on a balmy night in June or July. The sun has long set, and there above the grass, above the shrubs, you see a flash of light. Then another. A couple flashes glint from down in the grass. Some of the lights zigzag, others form an ephemeral “J”. Some go up, others go down. Some flash high in the air, some flash at medium height, and some flash close to the ground. Some flash all night, some flash for only a few minutes. The more you watch, the more variations you see. What does it all mean? Perhaps it is best we start simply. Only male fireflies fly. Therefore, any flashing you see above the ground is a male firefly. The females do not fly (they don’t have wings), so they flash from the ground. Now it gets more difficult, for there are many species of fireflies and each has its own flash pattern, which can vary in color, brightness and timing. Some species flash early in the night, while others prefer a later hour. Each species also claims a preferred height above the ground at which to make its display. If you learn all these characteristics, you are well on your way to knowing which fireflies like your yard. Let’s take a look at a very common firefly, Photinus pyralis (sorry – they don’t have common names). You can recognize this firefly’s pattern easily: it is bright yellow and its flash is an upward rising light, forming a “J”. In the early part of the night, P. pyralis flashes close to the ground, but as the night progresses, he moves higher. He starts off by giving a set of flashes, each about six seconds apart (depending on the temperature; the warmer the night, the closer together the flashes will be). The female will respond with a flash about two seconds after the male flashes. If he sees this, he flies towards her, the two repeating their sequences until they meet. After a tete-a-tete, the female will be off to lay her eggs (in some species the eggs glow), from which will emerge larvae that we call glowworms. The larvae lurk underground until spring, hunting voraciously for subterranean prey. Some species will stay as larvae for a second year. Anyway, come spring, they pupate and emerge as adults. But what about that light? Where does it come from? Does it burn? The glow of the firefly is a natural light called biolumenesence. Biolumenesence is a cool light, meaning that the energy that is released in its making goes almost entirely into making light – little to no heat is produced. If only mankind could replicate this! In these insects the light is the result of a chemical reaction that takes place within the light organs on the underside of the abdomen. 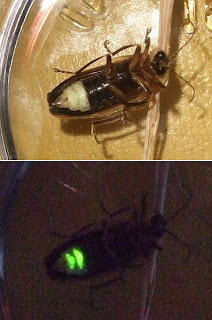 The firefly produces two of these chemicals: luciferin and luciferase. Added to these is ATP (adenosine triphosphate), a chemical that all living things have. The final ingredient is oxygen, which the firefly acquires through small openings along its abdomen. Once in contact these chemicals and voila! there is light. It’s like magic. Seeing fireflies in your yard, catching fireflies in a jar, it’s a kind of rite of passage that every child should enjoy. This summer it seems like we have an abundance of fireflies, which is a wonderful thing. Some areas, though, are suffering a derth of fireflies. The southeastern US has seen a decline upwards of 70% in firefly populations. Biologists have been researching the cause for this, and light pollution seems to be the culprit. Street lights and house lights are huge contributors to this, but the new fad of solar lights along walkways and gardens seems to have been the “one straw too many.” Now even those dark(er) corners of yards have been lit up. With all this light, fireflies either a) don’t know it is night and therefore are not signaling for mates, or b) can’t see the lights of potential mates because they are overpowered by all the artificial lights man has turned on. If there is no mating taking place, there will be no future generations of fireflies. It is a blessing to live in the Adirondacks, where we still have a fair bit of dark sky and can see the fireflies and stars before we go to bed. 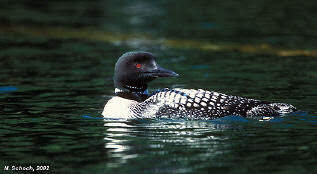 Loons are the quintessential symbol of wilderness. Just watch any TV show or movie that has a “wilderness” scene and you will hear loon calls in the soundtrack (even if it is in the desert). A stroll through any gift shop in the Adirondacks, Canada or Maine proves that they are probably the number one animal associated with the outdoors (competing only with moose and bears). There is nothing quite like the mournful wail of a loon floating through the night air as you lie in the dark trying to sleep. It is easy to see how people might once have associated them with unhappy or restless spirits. » Continue Reading. The Adirondack Almanack's contributors include veteran local writers, historians, naturalists, and outdoor enthusiasts from around the Adirondack region. The Almanack is the online news journal of Adirondack Explorer. Both are nonprofits supported by contributors, readers, and advertisers, and devoted to exploring, protecting, and unifying the Adirondack Park. General inquiries about the Adirondack Almanack should be directed to Almanack founder and editor John Warren. To advertise on the Adirondack Almanack, or to receive information on rates and design, please click here.